The nose guard -- also called the nose tackle -- is a key position on the defensive line. In a 3-4 defensive setup, the nose guard is situated in the middle of the defensive line and his primary area of responsibility is to disrupt the opponent's interior running game. The nose guard is usually noted for his strength and bulk, but the best at the position also have quickness that allow them make key plays while rushing the passer. 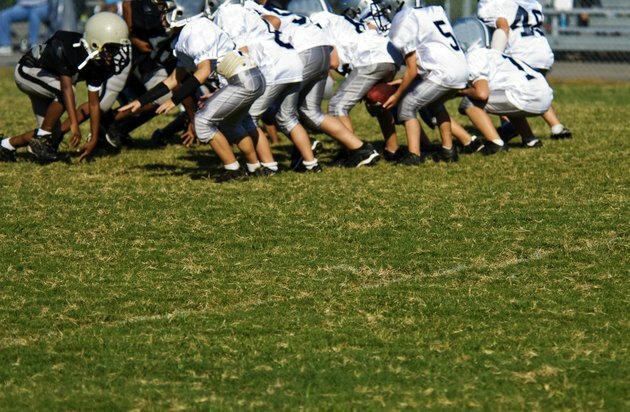 From youth football all the way up to the NFL, coaches teach players that the "low man wins." This is a lesson in leverage on the football field that is particularly appropriate for nose guards. To stop the opponents from running the ball consistently in the middle of the line, the nose guard tries to get his shoulder pads underneath his opponent's. This allows him to push backward and disrupt and clog the running lanes the offensive linemen are trying to establish. A good nose guard will always try to play his position with leverage. One of the most difficult and overlooked aspects of the nose guard's position is that he must find the ball carrier and then make a play. When you line up right across from the center in a three- or four-point stance, you are low to the ground and you may have a hard time seeing into the backfield. Yet you must locate the ball carrier from the formation the team is in and get through the line so you can tackle him before he has a chance to pick up significant yards and make a big play. This requires film study to know your opponent's tendencies, the ability to fight off blocks and the quickness to knife through and hit the ball carrier. The best nose guards in football will find a way to get through the line of scrimmage and pressure the quarterback up the middle. A nose guard who can do this collapses the pocket all by himself and makes life miserable for the quarterback. When a quarterback gets ready to throw the football, he steps up into the pocket before letting it go. If the nose guard is charging into the pocket, he prevents the quarterback from throwing from that ideal spot. The two most common defensive setups are the 4-3 defense and the 3-4 defense. In the 4-3, the defense has four defensive linemen and three linebackers. In the 3-4 set, the defense has three defensive linemen and four linebackers. In the 3-4, the nose guard does the same job as the two defensive tackles in the 4-3 setup. This means he must be a dynamic player who has overpowering strength, quickness, instincts and understanding of the game. If a team does not have a nose tackle with these characteristics, it may have to consider switching to a 4-3 setup. What Do Coaches Look for in Varsity Soccer Players?